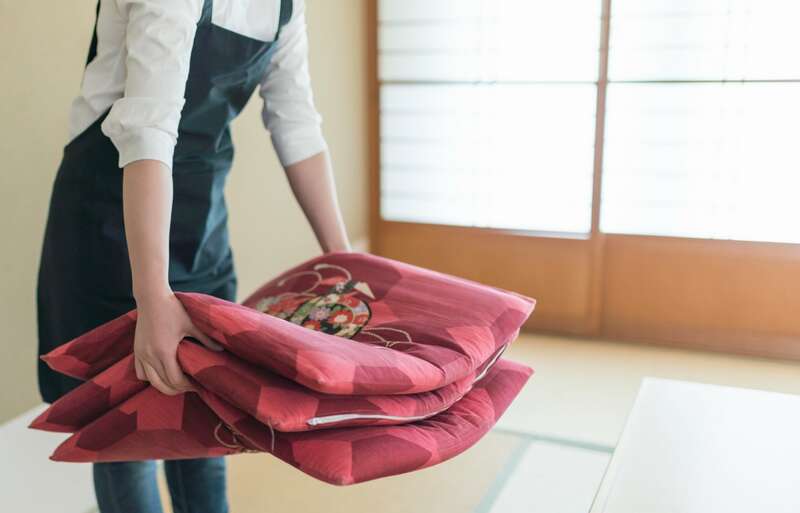 If you live in Japan, whether at a friend's house or in a formal reception room, you will eventually be faced with a situation where you need to sit on a Japanese cushion, or zabuton (座布団). Zabuton may look like ordinary cushions, but there are some special manners associated with sitting on them. So what's the proper way to do it? Zabuton are usually set in a Japanese-style reception room to welcome guests. However, you shouldn't sit without first receiving the permission of your host—which should come pretty much as soon as you approach the cushion. After your host says “Dozo" ("Go ahead"), you may be seated. Now, even most Japanese people don't know or follow the formal etiquette, but if you really want to be on top of your game, first step forward to the left side of your cushion. Squat down, put your hands on the floor and only then slide yourself right toward the cushion. Touch down on your knees and then sit on your heels, with your feet out flat beneath you. This kneeling position is known as seiza (正座)—literally, "correct seating." If you can't stand on the left side because of the room layout, instead approach the cushion from behind. If you're seated on the most formal style of cushion, you'll find that only the front side of the cover has no seams, which will allow you to identify the font when in doubt. In more casual settings, your host may eventually suggest you sit more comfortably, likely saying something like, "Raku ni shite" ("Take it easy" or "Get comfortable"). The typical "relaxed" position for men is to sit cross-legged, or agura (胡座). When sitting less formally, women will usually sit with their legs out to the side, called yoko-zuwari (横座り). If you'd like to leave your zabuton, be sure never to stand up right on top of the cushion. The formal method is to first slide yourself to the left (or back) of the cushion using your hands and knees, then stand up on the floor. Never step on a 'zabuton'! Regardless of whether or not you're trying to impress, do avoid stepping directly on a zabuton. While the backs of your feet may of course touch it, and the sides of your feet are fine if you sit cross-legged, don't step on a zabuton with the soles of your feet. Your feet may damage the cloth of the cushion—and moreover, this could be seen as particularly disrespectful if your host's family crest is printed on the cover!